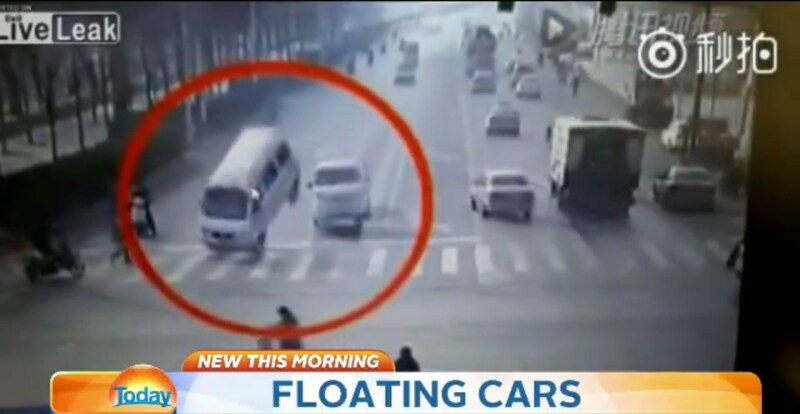 China Floating Cars Start LEVITATING Out Of The Blue! When you meet somebody you haven`t seen in a while in a rather unexpected place you say that it is a small world, don`t you? This statement is partly true but there are countless startling things occurring every second in this beautiful world of ours we are not aware of. In that case, this world is far from small. Not only remarkable things happen each moment, but also only a small number of such things are witnessed by the human eye, and are even rarely caught on tape. This situation with the China floating cars you are about to watch is really rare taped situation. This footage comes all the way from the other side of the planet, China. In it, you are going to see a truly unexplainable occurrence, at least at first glance! So what happens? This video is actually a CCTV footage recording a street somewhere in China when all of a sudden several vehicles start floating and then crushing down! Seems unbelievable when you see the China floating cars at first! But after careful reconsideration and the local authorities` report it turned out that it is “just” a snagged powerline. We do not have information about any alleged casualties, but we hope there are not! At last, click here to learn the best levitation magic tricks that you can perform with your kids!